EFAs Triple Omega provide a combination of Omega-3-6-9 essential fatty acids. Essential Fatty Acids are considered essential as they cannot be made by the body and have to be consumed within the diet. 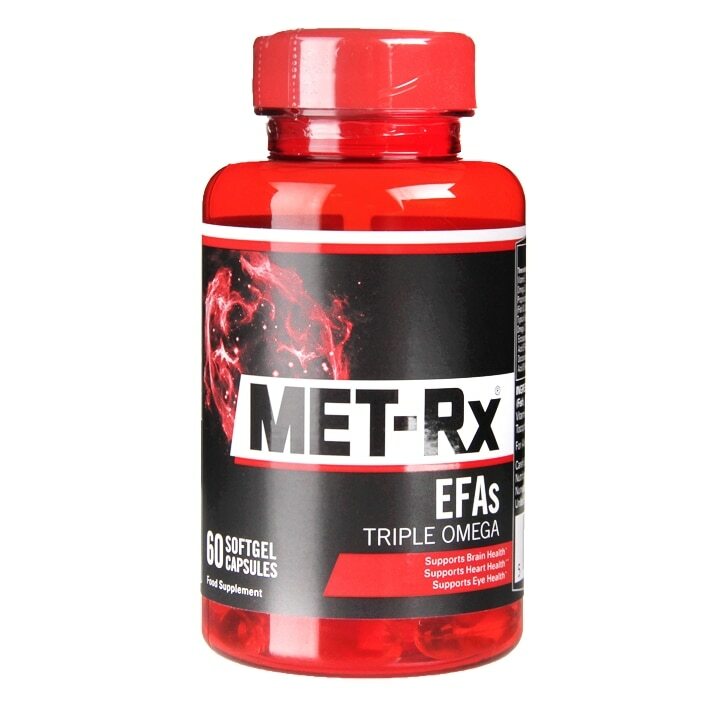 MET-Rx EFAs Triple Omega combines fish oil with flaxseed oil and starflower oil to help you obtain essential fatty acids in a contaminant free, pure form. DHA contributes to the maintenance of normal brain function and normal vision. The beneficial effect is obtained with a daily intake of 250mg DHA. EPA and DHA contribute to the normal function of the heart. The beneficial effect is obtained with a daily intake of 250mg EPA and DHA. Fish Oil, Starflower Oil, Capsule Shell (Gelatine, Glycerine), Flaxseed Oil, Vitamin E (as dl-Alpha Tocopheryl Acetate). Met-Rx EFAs Triple Omega is rated 5.0 out of 5 by 1.